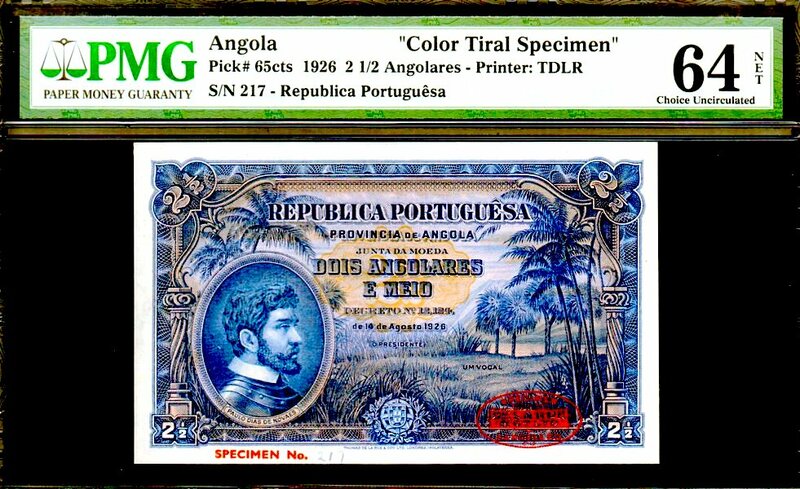 ANGOLA P29 1.3.1909 2500 REIS GRADED PCGS 25! ONLY 1 BY ALL TO GRADING CO'S! THIS ANCIENT PIECE (OVER 103 YEARS OLD) LOOKS ALMOST UNC!!! IT'S IN INCREDIBLE CONDITION FOR ITS AGE! WHAT AN AMAZING STORY AND LIFE "VASCO de GAMA" HAD, PLEASE READ BELOW, YOU WILL NOT BE DISAPPOINTED! VASCO DE GAMA WAS A PORTUGUESE EXPLORER, ONE OF THE MOST SUCCESSFUL IN THE AGE OF DISCOVERY AND THE COMMANDER OF THE FIRST SHIPS TO SAIL DIRECTLY FROM EUROPE TO INDIA. 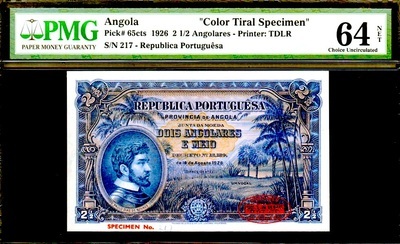 ANGOLA P65cts "SPECIMEN- COLOR TRIAL" 14.8.1926 "PAULO DIAS DE NOAES" 2 1/2 ANGOLARES SPECIMEN #217 GRADED PMG 64!! FINEST KNOWN BY ALL GRADING COMPANIES TO DATE (3 TOTAL GRADED BY ALL)! PAULO BECAME THE FIRST CAPTAIN- GOVERNOR OF PORTUGUESE ANGOLA, HE ARRIVED IN WHAT IS NOW PRESENT DAY ANGOLA ON FEB. 11 1575, WHICH HE EXPLORED DUE TO THE ALURE OF THE FAMOUS SILVER MINES OF CAMBAMBE. 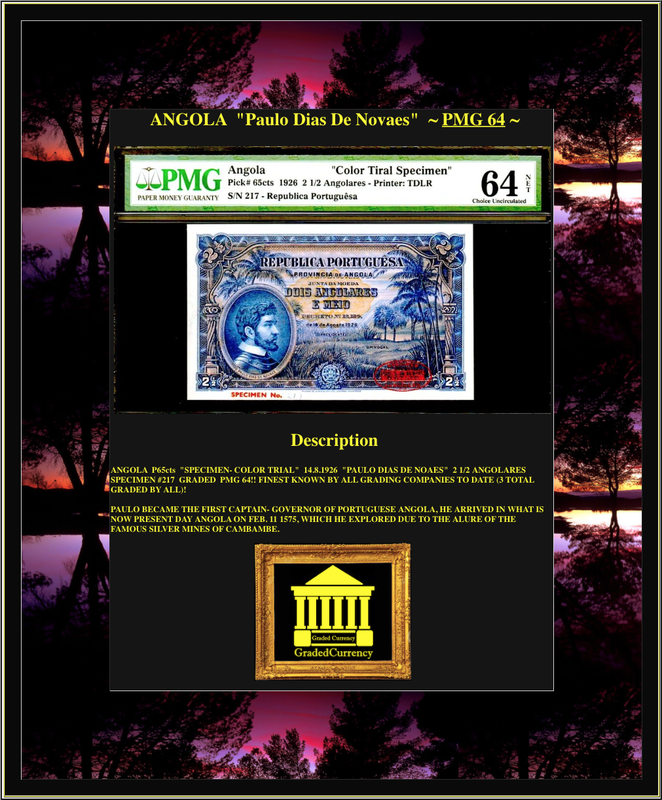 ANGOLA P66a "RED ELEPHANT" 14.8.1926 5 ANGOLARES GRADED CGC 35PQ VERY FINE!! ONLY 1 GRADED BY ALL GRADING COMPANIES TO DATE! 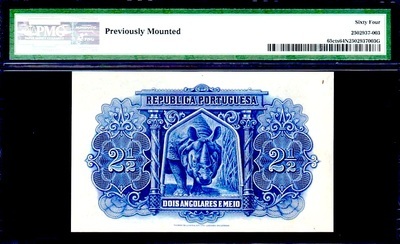 ANGOLA P69 "PAULO DIAS DE NOVAES" 28.4.1942 2 1/2 ANGOLARES "RHINO" GRADED CGC 55PQ! POP 0! ONLY 1 EVER GRADED TO DATE! ANGOLA P70 "LANDING OF SHIPS" 1948 1 ANGOLAR GRADED CGC 55PQ ALMOST UNCIRCULATED! ONLY 1 EVER GRADED BY ALL GRADING COMPANIES TO DATE!! 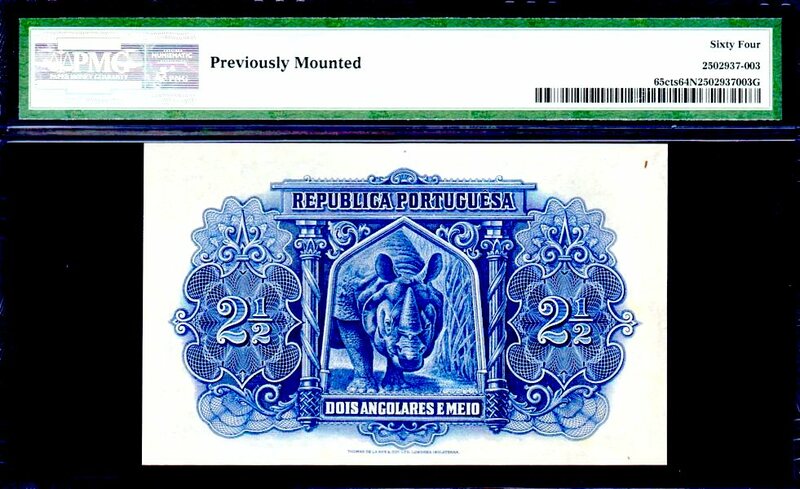 ANGOLA P71 "BOMBARDMENT of FORTRESS" 1948 2 1/2 ANGOLARES "RHINO" GRADED CGC 58PQ ALMOST UNCIRCULATED!! ONLY 1 GRADED BY ALL GRADING COMPANIES TO DATE! VISUALLY ARTISTIC & APPEALING VIGNETTES ON BOTH FRONT AND BACK OF THIS PIECE, TRUELY A GREAT DISPLAY NOTE! 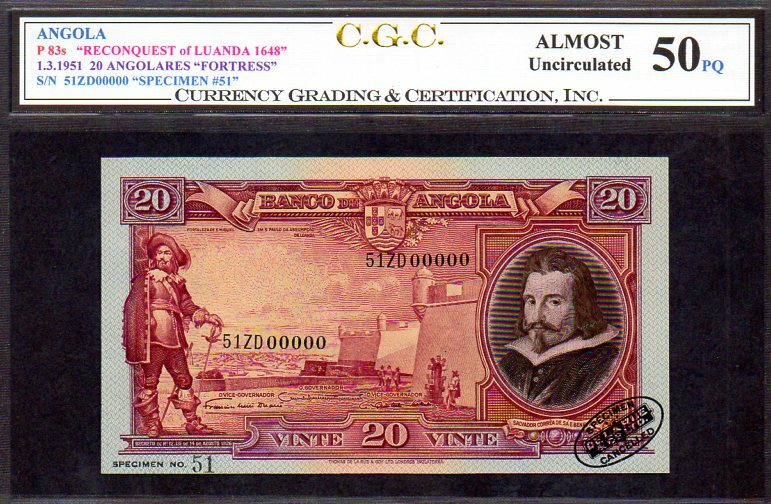 ANGOLA P73a "SALVADOR CORREIA" 1927 20 ANGOLARES GRADED CGC 30 VERY FINE! 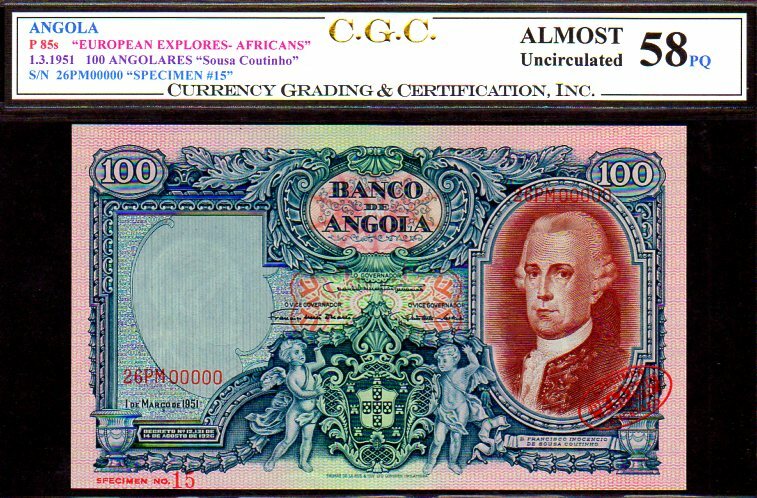 FINEST AND ONLY KNOWN BY ALL GRADING COMPANIES!! 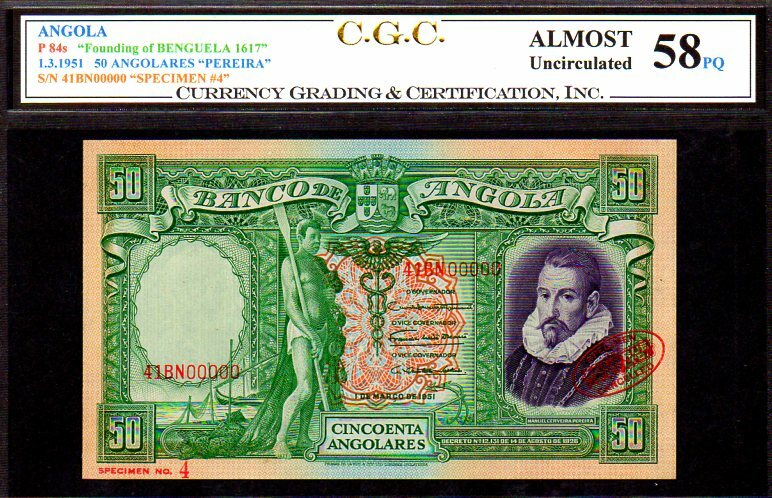 ANGOLA P73r "SALVADOR CORREIA" 1.6.1927 20 ANGOLARES "REMAINDER" GRADED CGC 67 ULTRA GEM!! 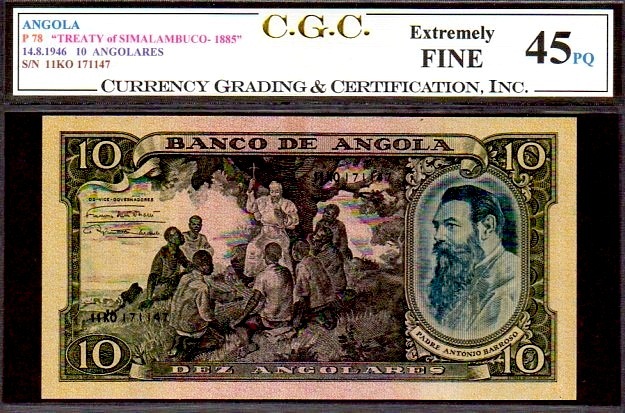 ANGOLA P78 "TREATY OF SIMALAMBUCO- 1885" 14.8.1946 10 ANGOLARES GRADED CGC 45PQ EXTREMELY FINE! ONLY 1 EVER GRADED BY ALL GRADING COMPANIES TO DATE!